Salt and brackish tidal marshes are a dominant and characteristic environment around St. Catherines Island and along the whole Georgia coast. The boat ride to the Island by way of coastal rivers traverses the extensive salt marshes on the mainland-side of the island. The marshes on the ocean-side of the island, unique among barrier islands, provide some of the most captivating viewscapes on the island. 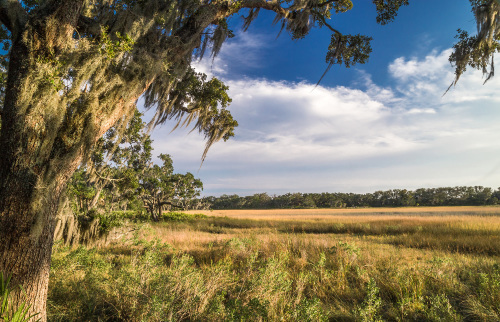 Marshes offer more than scenery— comprising highly productive wetland ecosystems with the highest annual production (over ten tons of organic material per acre each year) of organic material among all terrestrial, freshwater, and marine ecosystems. They serve an important role as nursery areas for fish, crustaceans, insects, and shellfish. Numerous bird species nest and feed in marshes. Marshes buffer the uplands of barrier islands and the mainland from storms, hurricanes, and changes in sea level. Salinity is a dominant ecological factor influencing the distribution of vegetation in marshes. The high salinity (20–40 parts per thousand) salt marsh communities are strongly dominated by smooth cordgrass, while the generally lower salinity (2–14 parts per thousand) brackish marsh is dominated by black needlerush (Juncus roemerianus). Vegetation is more diverse in the latter and may include: saltmeadow cordgrass (Spartina patens), glasswort (Salicornia bigelovii), saw grass (Cladium jamaicense), marsh elder (Iva frutescens), and wax myrtle (Myrica cerifera). Evapotranspiration concentrates salt, resulting in hypersaline conditions (greater than 40 parts per thousand) in pans, flats, or depressions within both marsh types. The variation in water and salinity levels in marshes and the gradation with freshwater wetlands provide essential feeding habitat for many bird and animal species. The natural variation in these wetlands has been diminished by human disturbance and changes in precipitation and groundwater flow. Federal and state agencies manage coastal wetlands in several areas. On St. Catherines Island, a marsh inlet—between Cracker Tom and South Beach Roads—is being managed for shorebirds and waterfowl. The marshes on the Georgia coast account for 33 percent of the total area of remaining tidal marsh on the eastern coast of the United States.33 Additionally, the Georgia marshes constitute some of the least polluted on the East Coast. While marshes remain common along the Georgia coast, the marshes around St. Catherines Island embody some of the most extensive and relatively unpolluted examples. The ocean facing marshes are also unique along the Georgia coast. South Atlantic Tidal Wetlands, Pennings et al. in Wetland Habitats of North America: Ecology and Conservation Concerns, edited by D.P. Batzer and A.H. Baldwin, University of California Press, Berkley, CA. Natural Communities of Georgia, L. Edwards, J. Ambrose, and K. Kirkman, University of Georgia Press, 2013. A Strategic Conservation Plan for St. Catherines Island, Georgia, Prepared for the St. Catherine’s Island Foundation- Robert D. Sutter, L. Gregory Low, Sara J. Gottlieb, June 2013.